David and Silvana Jenkins at Grace Chapel in Aina Haina. When the two Living Word Fellowship congregations held a joint worship service last Sunday, they sang and counted their blessings together. And that turned the subject to crops. The hosts of Grace Chapel of Honolulu pointed out the glorious green patch of grass thriving in a corner of their disrupted Aina Haina construction site as a source of thanksgiving. The 20 visitors from Hale O Kaula on Maui had lots to talk about, too, with onions thriving on their Pukalani acres and the prospect of selling the echinacea crop to a food supplement manufacturer. The Maui congregation's desire to build a chapel on its farmland has become a religious liberty case being fought in federal court. 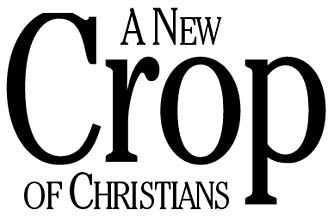 For members of the nondenominational Christian sect with roots in the Midwest, what is planted and grown around their churches is not just a landscaping scheme, it is the application of a fundamental belief. "We are stewards of the earth; it is an important part of who we are," said Hale O Kaula pastor David Jenkins. "We take St. Paul's words to 'release creation from futility' as a literal charge to get our hands dirty and work to repair the earth." Pastor David Boney conducts a service. That is the philosophy behind the Joseph Ministry, a precept of church founder John Robert Stevens, who started out as a tent revival preacher in Illinois and organized his own church in the 1950s. 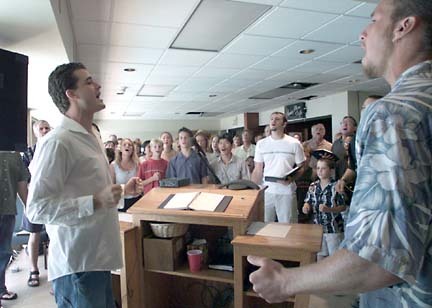 The 80-member Grace Chapel Honolulu is literally starting its Joseph Ministry from scratch. The church moved just months ago from a small Young Street property to two acres at 5275 Kalanianaole Highway. "I see this place as a provision from the Lord to our hands," the Rev. David Boney told the Sunday crowd. Nearly 100 people crowded into the clubhouse's second-floor space, formerly a weight room, which serves for gatherings while a new sanctuary is being built. "Our mission will be to restore this very unique place as a Hawaiian environment, with the values that existed between the ocean and the land," Boney said. A contractor has excavated four of the spa's eight tennis courts, leaving "sand and very dead earth, after 20 years under concrete," Boney said. The expertise of the University of Hawaii extension service and professional landscapers in the congregation will be tapped. But as for the digging, planting, watering, fertilizing, raking and harvesting from the fruit trees and crops envisioned, look to the pews. "Every one of us has many hats," said member Brenda Clawson. Her Kaneohe garden has been the salad source for potlucks for years. She and Sonya Stanchfield were watering cherry tomatoes and other potted plants at the Aina Haina site. "We'll be researching what works at the shoreline, what Hawaiian plants would be native to this area," said member Alan Short. The lush lawn was a result of such research, he said, "a sea grass that thrives next to the ocean." Boney said the ministry, named after an Old Testament patriarch "who was going to help preserve his people at a time of famine," is intended not just to raise food, but also to "provide a healthy environment, someplace that provides life." Family wholeness is an emphasis of the Living Word Fellowship, Boney said. "We tend to have younger people involved. When we take care of the earth, so many can be involved. We've had workdays every weekend since we bought the place. "We grow and eat things together," said Boney. "That's the awesome thing about this property: We can work together and play here; we can spend holidays together." Jeremiah Gruenberg and John Eckstrom lead singing. First row, from left: Amber Thompson, John Fry, Michael Bennet, Jeremy Siegle, Phillip Olson and Joshua Clawson. The former spa, for which they paid $5 million, has enviable "fellowship" dimensions including a swimming pool, the clubhouse with a kitchen already in use for potluck parties, and the oceanfront where some of the youth group surf after their gardening duty. 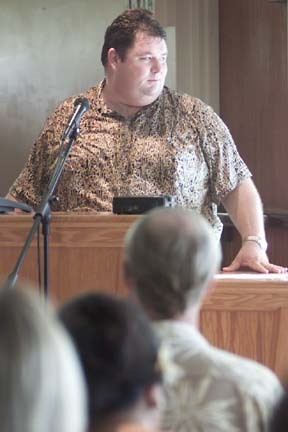 Boney came to Hawaii in 1997 from Iowa and had helped shepherd other churches in the sect through government zoning processes before working to secure the city conditional use permit for the residential Aina Haina property. There was some neighborhood resistance, but not the government rejection that has put Hale O Kaula into a court wrangle with no end in sight. The Maui Planning Commission twice denied the Maui congregation's application for a special use permit to build a sanctuary on its agricultural land. The church and the U.S. Justice Department charge the county with violating the federal Religious Land Use and Institutionalized Persons Act of 2000 in suits pending in federal court. The Maui church had met for about 50 years in a Haiku chapel that was recently sold. Sunday services attended by about 60 members are now held at the upslope farm. The Joseph Ministry thrives in Kula despite the limits of nature, said Jenkins. Deer broke down fences to get at the corn crop. Pheasants loved the tomatoes. A rainwater catchment system is the only irrigation resource now, but pipeline alternatives are being sought. Wheat grass and sprouts, for salad use by the congregation, are grown in the 1,800-square-foot concrete block agricultural building. Negotiations with Marilyn Farms, manufacturer of health supplements and organic products, may determine what herbs will be cash crops. A tree-planting project tomorrow at the county base yard in Keokea is an example of how Hale O Kaula takes the Joseph Ministry to the community. On Arbor Day they gave away tree seedlings. Church members are volunteers on Kula Community Association and Outdoor Circle projects, such as planting done at Kula ball field. 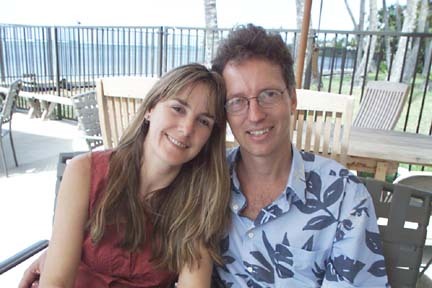 "We're connected to the earth and take responsibility for it," said Jenkins, who has been with the Maui church for 20 years and became pastor three years ago. A farm wagon float in the recent Makawao rodeo parade, with church members singing and playing country gospel songs, won Hale O Kaula an award as best musical entry. Boney said: "We try not to be a people who come together only at a service. We try to walk out our integrity with a lifestyle. Where the kids stay in a relationship with the Lord is where they have it on a daily basis."